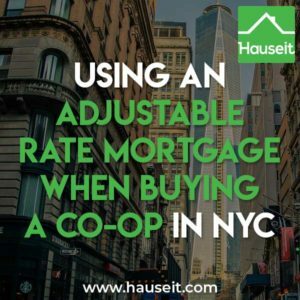 Co-op buyers in NYC are often surprised to find out that many buildings have restrictions on using an adjustable rate mortgage. 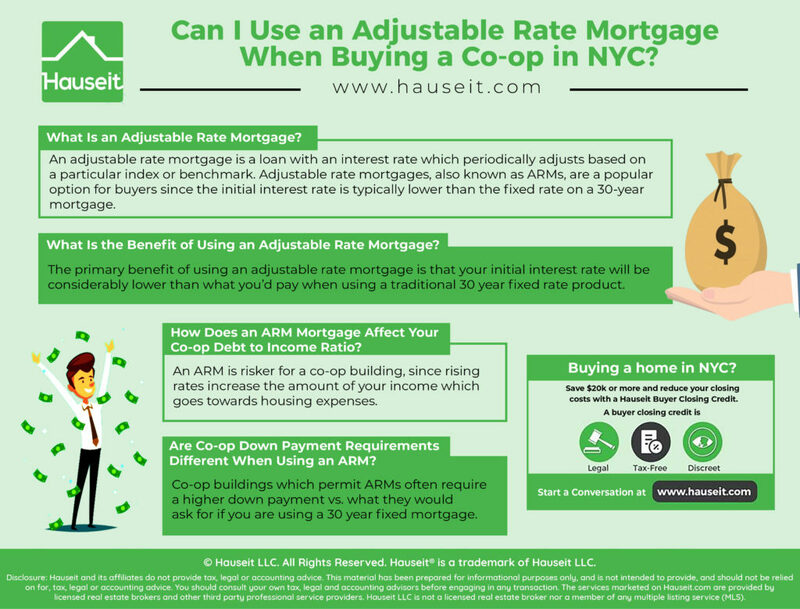 Some New York City coops prohibit adjustable rate mortgages altogether, while others allow them subject to certain guidelines. Co-ops which permit the use of ARMs often require a higher down payment in addition to a stress test of your debt-to-income ratio based on the lifetime interest rate cap of your loan. What Is the Benefit of Using an Adjustable Rate Mortgage? How Does an ARM Mortgage Affect Your Co-op Debt to Income Ratio? What Are the Risks of Using an Arm When Buying a Co-op? Are Co-op Down Payment Requirements Different When Using an ARM? An adjustable rate mortgage is a loan with an interest rate which periodically adjusts based on a particular index or benchmark. Adjustable rate mortgages, also known as ARMs, are a popular option for buyers since the initial interest rate is typically lower than the fixed rate on a 30-year mortgage. ARMs have lower interest rates than 30 year fixed mortgages because the ARM product transfers some of the interest rate risk from the lender to the borrower. The lender can afford to charge a lower interest rate on ARMs since there is less overall interest rate risk for the bank to hedge against. Most adjustable rate mortgages today are hybrid ARMs with an initial fixed interest rate period. Two popular examples are the 5/1 ARM and the 7/1 ARM, under which the initial interest rate remains fixed for 5 or 7 years respectively before adjusting every year thereafter. It’s worth noting that most ARMs have caps on how much the interest rate may increase between each period and the maximum lifetime interest rate increase over the life of the loan. The primary benefit of using an adjustable rate mortgage is that your initial interest rate will be considerably lower than what you’d pay when using a traditional 30 year fixed rate product. The initial teaser rate of a Hybrid ARM can substantially reduce your cash flow outlay during the fixed period of the loan. If you plan on selling the property before the expiration of the ARM’s fixed rate, then it makes sense to use an ARM instead of a 30 year fixed rate mortgage. An ARM is risker for a co-op building, since rising rates increase the amount of your income which goes towards housing expenses. In other words, rising rates reduce your debt-to-income ratio. Co-ops do not like this, as a higher debt-to-income ratio increases the risk that you might not be able to afford your co-op monthly maintenance payment. 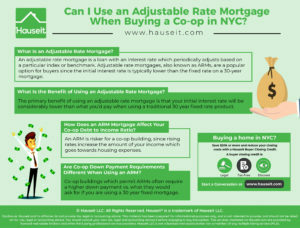 As a result, many co-op buildings in NYC prohibit the use of adjustable rate mortgages. Those which permit the use of ARMs will often ‘stress test’ your debt-to-income ratio by requiring you to calculate it under the maximum interest rate allowable under the ARM. Note that in the interest of conservative stewardship, a variable mortgage will be considered as if it were a fixed mortgage whose interest rate is the maxim mum rate limited specified for that variable mortgage. The interest payment calculated on the maximum rate will be used in the income to debt formula. The conservative calculation methodology above makes it all but impossible for an average income buyer to meet the co-op’s debt-to-income requirements. This co-op essentially prohibits ARMs in all cases except for someone whose income is stratospheric, and if that were the case the buyer would probably be looking at a much larger apartment in a different co-op. The main risk of using an ARM is that you are exposed to substantial increases in your interest rate and monthly payment once the fixed interest rate term expires. The uncertainty of what your monthly payments are going to be also increases stress levels when it comes to home ownership. If you think you’ll sell the property after a few years, using an ARM can save money on your monthly payment. However, what if your plans change and it no longer makes sense to sell before the fixed interest rate period expires? Co-op buildings which permit ARMs often require a higher down payment vs. what they would ask for if you are using a 30 year fixed mortgage. b. 70% financing of the purchase price permitted for an adjustable rate mortgage and/or interest only mortgage. The requirements above are rather tricky, as they are buried in the building’s purchase application and not indicated on the listing online. A buyer may not realize that a higher down payment is required until he or she has already submitted the mortgage application and locked the interest rate. 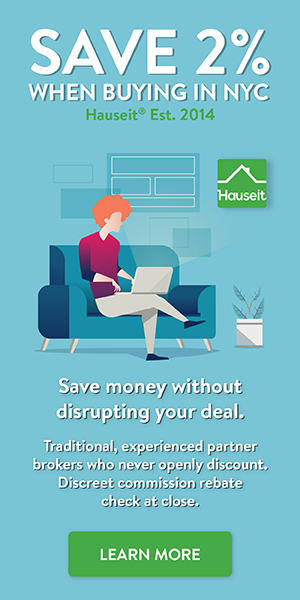 We’ve even heard of a situation where a buyer hard already received his mortgage commitment letter and submitted the purchase application, only to be told by the managing agent that the board wouldn’t consider the application unless he changed to a fixed rate loan. This is a good example of why it’s a good idea to work with a seasoned buyer’s agent when buying a co-op apartment in NYC.